Eric Carle does it again. A miracle of a book: feel the sun, the soil, the magic of a flower growing. Turn your face to the sun and celebrate life with the Hungry Caterpillar man. When a tiny seed is blown away from its parent plant, it travels a very long way. Finally it lands on fertile earth, and the little seed grows and grows. Soon it is the tallest, biggest flower for miles around. Imagine that! 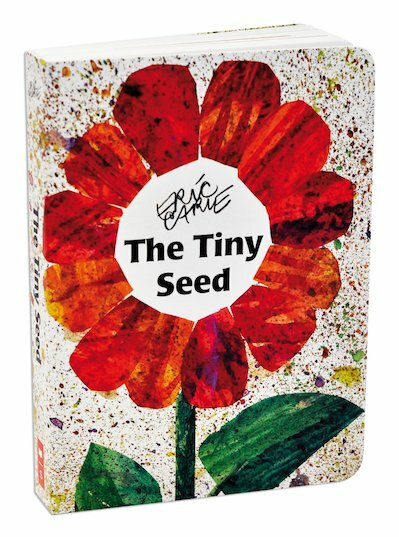 Then one day the Autumn wind blows again, and thousands of new tiny seeds begin a journey of their own… Eric Carle’s trademark torn-paper pictures have never glowed more brightly.